Have I mentioned that I am training for a half-marathon? Well I am. And this time around I’m actually doing a really good job with my 6 day a week training program (amazing what the lack of Bar studying and unemployment unanticipated free time can do with the motivation) and can’t wait for my race on May 1st. And while I will admit that it is nice for my clothes to be fitting a little better and my legs to be more toned than they have been since this little thing called law school, the best thing about training for a half is the food. You see, now that our Saturday long runs are getting into the 8, 9 10 mile range, I’m starving. I seem to just not be able to eat enough to keep up with my metabolism. But this is a very good thing. You see, I have these pancakes to help me out. I will admit that they take a little more time than just scrambling up a couple eggs to eat with some toast but they are worth the wait. Fluffy, light, and the perfect vehicle for a pool of good maple syrup. Even better because I dug out a quart of frozen blueberries from last summer. Just the taste of last summer gives me hope since it is just the time to “spring forward” and finally enjoy dinner, or a 6PM run with the sun. Did I mention that it hit 60 degrees this week? And that I ran in shorts? Bliss. Combine flour, salt, baking powder, and baking soda in a bowl and mix well. Mix eggs, buttermilk, and milk in another bowl. Combine the wet and dry mixes until just lumpy. Pour in butter and stir well. Fold in raspberries. Preheat your oven for “warm”. Place a cookie sheet in the oven to hold the finished pancakes and keep them warm. This is less important if you have a big griddle to work on more than one pancake at once. I don’t have that luxury. Melt about a tablespoon of butter in a small bowl or ramekin. Heat pan over medium heat. Brush a little melted butter on your frying pan or griddle. I like to do a little swipe of butter for each pancake. Pour a scoop of batter onto the pan when the butter is hot. I like to use about 1/4 cup for each pancake. Make sure you get enough blueberries with each scoop. When bubbles appear on the top of the pancake, flip to cook the other side. It could take as little as 2 minutes and as long as 5. I like to say when the edges of the pancake look like they are done and that the raw middle is trapped, its time to flip. Remove the pancake from the pan when the bottom is golden. Serve hot or let the pancakes cool and refrigerate them to be toasted later. This recipe makes about dozen pancakes. Perfect for a kicked-up metabolism. 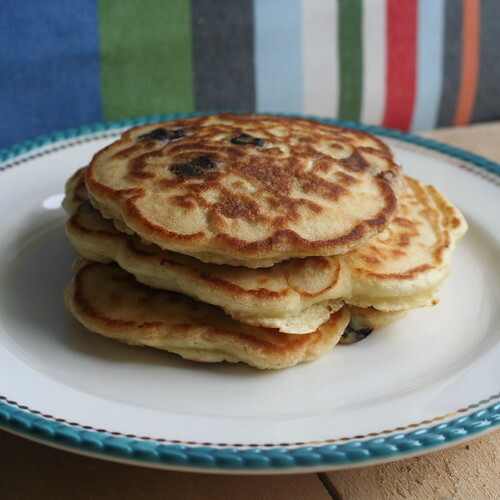 This entry was posted in Recipe and tagged Blueberries, Breakfast, Buttermilk, Pancakes, Running. Bookmark the permalink. I made pancakes last weekend too! They ARE a great reward for working out:) These look great. Good luck w/ your half! 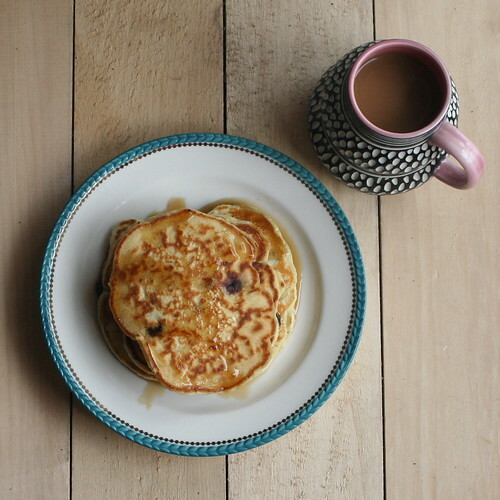 good luck with your training….love pancakes myself…YUM!! 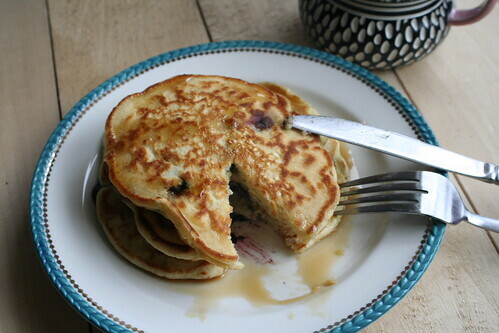 These pancakes look absolutely perfect. Lovely photos, Whitney! 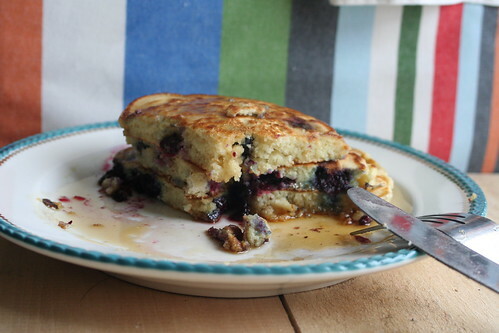 I came across your photo on Photograzing, and I laughed, because I had blueberry pancakes this weekend for my half marathon training, too. Those look delicious! I wanted to make pancakes this Sunday, but some Saturday night festivities and springing ahead got in the way. I have my fingers crossed for this Sunday, though. I have good maple syrup from Vermont and everything. Haha, I know what you mean about the voracious appetite when you’re running long distance. Your pictures are great – I especially love that last one with the pool of syrup running across the plate. I would say I’m jealous of your 60 degree weather, but it actually hit 60 here in CT today – wonderful! Enjoy the weather!